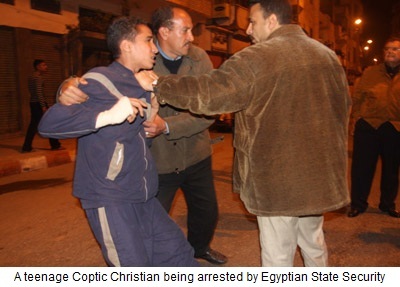 Egypt (AINA) -- Egyptian State Security has intensified its intimidation of the Coptic Church and Christians in Nag Hammadi, and neighboring Bahgoura, by carrying out random arrests of Christian youth. The campaign against Christians started on Friday January 7, 2010 and is continuing; multiple members of families have been arrested without warrants. Most arrests are being carried at dawn. More than one hundred Christian youth have been arrested without charge. Arrests of Copts after every sedition is the usual scenario as a pressure card in the hands of State Security to force the church and Copts to accept "reconciliation", in which Coptic victims give up all criminal and civil charges against the perpetrators. Because of the reaction in Egypt and worldwide to the shootings and the role of the State Security, Bishop Kyrollos was asked issue statements downplaying the negligence of State Security. It is believed the arrests of the Coptic youth is a pressure tactic to force him to recant his accusations. Anwar Samuel, a head teacher from Nag Hammadi, told Freecopts that State Security came to their home at four o'clock in the morning, looking for his nephew Mohareb, who happened to be in Kuwait. "Instead they arrested my three other nephews, Fadi, Tanios and Wael Milad Samuel, and took them away in their pajamas." He said they have been subjected to electric shocks. Coptic News Bulletin contacted several families who confirmed that males as young as 16 were taken away by the police. In an aired interviews, affected families told how the Police tricked their sons into going with them, by telling them that Bishop Kyrollos wanted them to do so for their safety. Habib Tanios was arrested on charges of firing on people who burnt his home in Bahgoura, although he has no rifle. According to sources close to Freecopts, strict state security instructions were issued to the clergy in the parish of Nag Hamadi, to suppress any move by the Copts affected by the events and the families of those killed, to demonstrate or protest, accompanied by explicit threats that police will be using live ammunition. After the Nag Hammadi shooting on January 6, in which 8 Copts were killed and 15 injured as they came out of Coptic Christmas Eve mass (AINA 1-7-2010, 1-10-2010). Bishop Kyrollos of Nag Hammadi Diocese criticized the lack of police protection of the church, which is usual during such events. He held State Security responsible especially that he had received death threats, and was the intended target of the shootings. Conflict between State Security and Bishop Kyrollos arose due to his insistence on compensation for the Copts of Farshout who lost property and businesses caused by Muslim mob violence against them end November 2009 (AINA 11-22-2009, 11-23-2009, 11-29-2009). None of the state officials attended the celebrations at Church which many took as a sign of their knowledge of the forthcoming shootings.